The house centipede is often seen darting across floors at high speed, occasionally stopping suddenly and remaining motionless for some time before racing off once more. Its cylindrical body can grow to an inch or more in length. It is yellowish brown and bears three dark longitudinal stripes dorsally. The 15 pairs of slender, banded legs increase in length from the front to the back of the body. The last pair is much longer than the others. The legs give the animal the appearance of great size. Unlike most other centipedes, house centipedes and their close relatives have well-developed, faceted eyes. S. coleoptrata is probably indigenous in the Mediterranean region, but it has spread through much of Europe, Asia, and North America. In the United States, it has spread from the southern states and Mexico. It reached Pennsylvania in 1849, New York in 1885, and Massachusetts about 1890, and it is now extends westward to the Rocky Mountains and beyond (Lewis 1981). The house centipede is found both outdoors and indoors. Indoors, it is an inhabitant of damp places, such as bathrooms, moist closets, and cellars, crawl spaces, and piles of fire wood. Drying and cleaning these areas should help to control infestations of these centipedes. 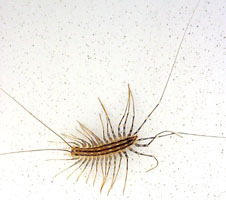 In captivity, house centipedes feed readily on cockroach nymphs, flies, moths, bedbugs, crickets, silverfish, earwigs, and other insects and small spiders. They capture prey by half pouncing and half lassoing them. They can capture several prey items at one time. They feed on one specimen while holding the others with their quivering, lashing appendages (Lewis 1981). Eggs are laid in spring and early summer. In laboratory rearings, 24 females produced an average of 63 eggs each and a maximum of 151 eggs. Larvae hatch with four pairs of legs. There are five more larval instars with 5, 7, 9, 11, and 13 pairs of legs (Cloudsley-Thompson 1968). 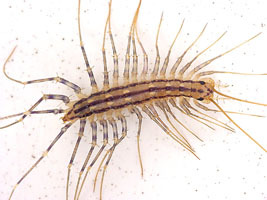 Although house centipedes are not aggressive, and their jaws are not powerful enough to break human skin easily, they will sometimes bite in self-defense. Severe swelling and pain can result from the venom injected, but in most cases the bite is no worse than the sting of a bee. Cloudsley-Thompson, J. L. 1968. Spiders, scorpions, centipedes and mites. Pergamon Press, Oxford. 278 pages. Lewis, J. G. E. 1981. The biology of centipedes. Cambridge University press, Cambridge. 476 pages. Marlatt, C. L. 1914 (revised 1930). The house centipede. U. S. Department of Agriculture Farmers’ Bulletin 627: 4 pages.